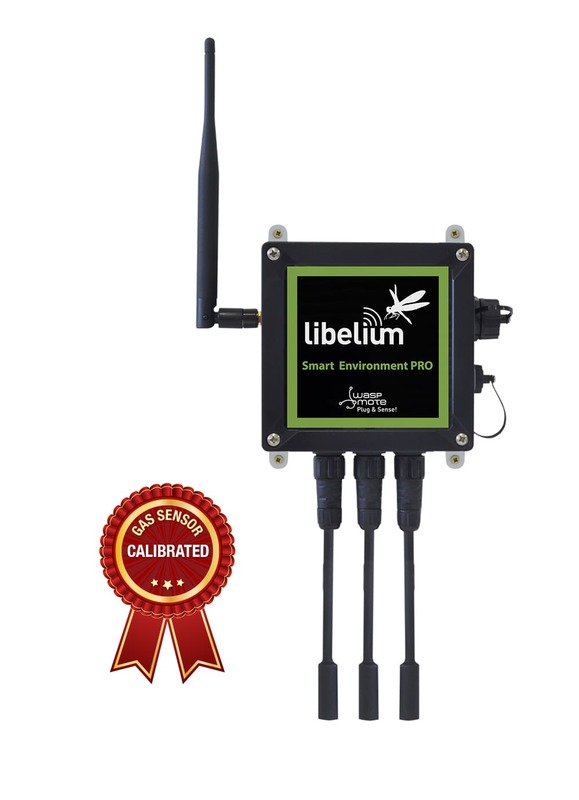 Libelium released a new Gases PRO Sensor Board in May 2015. 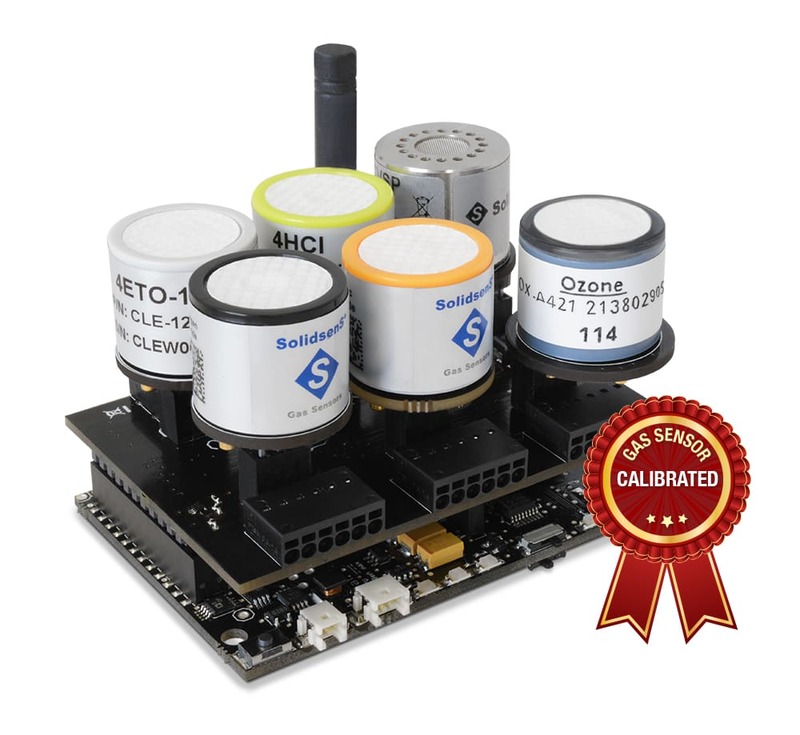 This platform features precision sensors to enable the implementation of urban monitoring, air quality, industrial, environmental or farming projects with high requirements in terms of accuracy, reliability, and measurement range. The new gas sensors line is available for both Waspmote OEM and Plug & Sense!. Two different Sensor Boards are available to monitor and measure gas levels: Gases Sensor Board (Gases) and Gases PRO Sensor Board (Gases PRO). Number of sensors: Gases PRO integrates 16 different gas sensors. The original Gases board integrates 12. See the complete list of parameters in the tables below. Increased accuracy: Gases PRO measures exact values of gas concentration in ppms. The Gases board shows a range of concentration low / medium / high. Details of the accuracy ranges figure in the tables below. Precision sensors: A sensitive new particulate matter sensor—commonly known as dust sensor—is included in the Gases PRO board. This sensor allows the measurement of PM1, PM2.5, and PM10 particles and comes calibrated from the factory. Should I choose Gases or Gases PRO? Libelium has created different systems in terms of accuracy and pricing. The customer should consider Gases PRO if she needs maximum performance sensors for metering that require accurate ppm or percentage. If the project just needs to detect gas presence or gas levels, the standard Gases Sensor Board is sufficient. The new Gases PRO Sensor Board can read up to 16 gas sensors; it also has a high-end sensor for three parameters: temperature, humidity and pressure. * Accuracy values have been calculated at average conditions: 20ºC / 101300 Pa. Accuracy levels may differ with different temperature and pressure levels, aging and in presence of third type of gases which cause cross sensitivity. See each Gas Sensor documentation for more information. How are the Gases PRO sensors calibrated? All the Gases PRO sensors are linear, so they behave according to a simple line like y = f(x) = m·x + c. On the other hand, the Gases Sensor Board sensors show a logarithmic response, which is harder to handle. All the gas sensors for Gases PRO are calibrated by the sensor manufacturers, in laboratories. To obtain maximum accuracy, a two-point calibration process is performed on controlled concentrations of gas in vacuum chambers. Due to the linear nature of the sensors, these two points are enough to correct the two possible drifts in m (slope) and c (constant offset). Our sensor manufacturers provide a calibration certificate for each individual sensor, with two calibration parameters. Libelium stores these parameters in an EEPROM, a non-volatile memory chip inside each gas sensor. When the user performs a sensor reading, the software system designed by Libelium reads the sensor signal and the two parameters. These three values are processed by the system, and a temperature compensation calculation is applied. From this data we obtain the concentration value in ppms – the value we want to measure. The new Temperature, Humidity and Pressure sensor for Gases PRO is calibrated in the factory. It comes with three calibration points for temperature, six points for humidity and nine points for pressure. These three parameters are automatically inter-compensated to obtain extreme accuracy. Gases PRO Sensor Board is included in Libelium's new Smart Cities sensing solution, Plug & Sense! Smart Environment PRO. This board also allows to obtain information about particle size and density ranging from 1um to 10um (PM1 / PM2.5 / PM10) in its surroundings, using the new particulate matter sensor—commonly known as dust sensor. For more Technical information go to Waspmote and Plug & Sense! website, and to the Gases PRO Technical Guide . If you are interested in purchase information please contact the Libelium Commercial Department.